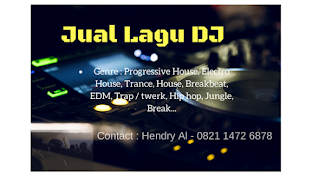 Genre lagu dj soulful House merupakan sub-genre dari aliran musik House yang biasa dimainkan DJ di dunia. Meskipun jarang peminatnya hanya untuk kalangan tertentu, tapi sampai sekarang 2015 aliran musik soulful house ini masih sering dimainkan dj. Misalnya, di lounge, cafe, pub dan lainnya. Terkadang Dj memainkan genre soulful house di awal - awal main. Nah buat kalian yang butuh list lagu dj soulful house enak terbaru 2015, di bawah Ane kasih daftarnya. Pilihan dari folder update bulan april - mei, dari ratusan lagu genre ini. Sebagian ada lagu lama tapi di remix kembali ke versi baru. 1. 4BeatClub - Soul Food (Original Mix) Freche Fruchte s.
3. Antonello Ferrari, Bart Gori - Let The Music (Main Mix) Kings Of Groove. 5. AutoCharm - Who Am I Rubber Taxi Records. 6. Bag - Back IT Up feat Taka Boom (Supernature Mix) Bacci Bros Records. 7. Barbara Douglas - Let Me Dance For You (Original Mix) Silk Records. 8. Barbara Tucker - Express Yourself (Original Mix) Bacci Bros Records. 11.Beat Amusement - Let Me Fix It (Original Mix) Rimoshee Traxx. 12.Beat Rivals, Natasha Watts - Lift Your Voice (Original Mix) Rival Beat Records. 14.Chymamusiqe - Vinyl Recovery (Main Mix) Sci Fi Productions. 15.Cool Daddy - Golf Boogie (Original Mix) SpekuLLa Records. 16.Cool Million - Sweet Baby (Jonny Montana & Craig Stewart Mix) Sedsoul. 17.Cool Million - Sweet Baby (Richard Earnshaw Big Vocal Mix) Sedsoul. 18.Corvino Traxx - I Cant Tell You SOUNDMEN On WAX. 19.Cotterell - If I Was You (Garage Cut) Plastik People Digital. 21.Danny Clark, Darryl D'Bonneau - Solid Ground (Main Mix) Solid Ground s.
23.Dimitri Bruev, Veronique Andy - Life (Extended Mix) Planet House Music. 27.DJ Paleface - Look Into My Eyes feat Olivia (Tempo Elektrik Remix) Xylo Music. 28.DJ Thes-Man, Anthony Poteat - Made A Way (Original Mix) Ohyea Muziq. 29.Djeff Afrozila, Tchoboly - Minha Vizinha (Alex Finkin Soulful Remix) Kazukuta Records. 30.Djeff Afrozila, Tchoboly - Minha Vizinha (Mark Di Meo Latin Vocal Remix) Kazukuta Records. 31.Double Deep - People (Tropical House Version) Bikini Sounds Rec..
32.Enea DJ, Ladybird - Star Night Love (Groove Assassin Remix) Uno Mas Digital s.
33.Enea DJ, Ladybird - Star Night Love (Silvia Zaragoza Remix) Uno Mas Digital s.
34.Eric Powa B - Be over Me Heavenly Bodies Records. 35.G.L.O, Mark Stone - Don't Take Me for Granted (Mark Stone Remix) UDM Show Records. 36.Gino Love - Frame Of Time (Original Mix) Yoo'nek Records. 37.GLounge - Deep Vibes GR8 AL Music. 38.Gnarly Cuts - Everyman (Original Mix) Gnarly Cuts. 39.Guido P, Josiah Ruff - Happy Land (Original Mix) . 41.Guido P, Josiah Ruff - Happy Land (P's HSR Mix) HSR Records. 42.Guido P, Josiah Ruff - Happy Land (Soulbridge Mix) HSR Records. 43.Guy Robin - Private Life (feat Anthony Moriah) (Terry Hunter Vocal Mix) Home. 44.HaK - Peace & Harmony (Sudad G Remix) unquantize. 45.Hani, Andrea Martin - Higher Ground (DJ Friendly Mix) Soterios. 46.Hani, Andrea Martin - Higher Ground (Saxy Mix) Soterios. 47.Hardage - Beautiful Day (feat Jocelyn Brown) (Arduini & Pagany Remix) Bacci Bros Records. 48.Hardrive - Deep Inside Strictly Rhythm Records. 49.Harley&Muscle, Monday Michiru - Possibilities (Hugging Caio Deep Mix) Soulstar Records. 51.House Of Glass - Dancin' with You feat Romina Johnson (Original Mix) Bacci Bros Records. 52.House Perfect - Dubby Jazzy (Original Mix) Adam Funk Club. 53.Ignacio, Chappell - You (Original Mix) DiepSide Music. 54.JammHot - Under My Skin (Original Mix) Made Fresh Daily. 55.Jeremy Sylvester - I'll Be There (LDN Dub Vocal Mix) Urban Dubz Music. 56.Jersey Maestros, Anthony M Johnson - Move On (Original Mix) Gotta Keep Faith. 57.Jocelyn Brown, Oliver Cheatham - Mindbuster (Miami Collective Mix) Bacci Bros Records. 58.JoioDJ - Profundo Misterio (Original Mix) Dejavoo Records. 60.Leo Lippolis, Natasha Watts - I Need You (Original Mix) Gotta Keep Faith. 61.Leotone - House Music (Retro Style) Leotone Music. 63.Lombard Street - Play My Tune (Original Mix) Snazzy Traxx. 64.Lombard Street - The Best Day (Original Mix) Snazzy Traxx. 65.Luman Child, Joseph Jr - Going Through Changes (Main Mix) Solid Ground s.
66.Lyrical Angela - Paxao (Ultra Soul Project Vocal Mashup) TAM Digital SA. 67.Marc Cotterell, Tears Of Velva - For Those We Love (Original) Plastik People s.
69.Marc Tasio, Bibi Provence - Close To You (Original Mix) HSR Records. 70.Marc Tasio, Bibi Provence - Never Too Late To Love (Extended Mix) Disco Balls Records. 71.Marc Tasio, MJ White - Unconditional Love (Original Mix) HSR Records. 72.Max Marinacci, Fatimah Provillon - Sunday Morning (Original Mix) Solid Ground s.
73.Miami House Party, Geneva Lane - Closer To Me (REDJ Extended Mix) KMG Records. 74.Michele Chiavarini, Marvin Jason, Tyrone Lee - Make A Difference (Original Mix) Solid s.
75.Miguel Migs, Meshell Ndegeocello - What Do You Want (Migs Salted Vocal) Bargrooves. 76.Mister O - Lights Out (Kaskade Remix) Viva s.
77.Mister O - Lights Out (Original Mix) Viva s.
78.Mustafa - Sina (Soulful Mix Instrumental) Staff Productions. 79.Mustafa - Vem pra sambar (Hedi Benromdan - Balearic Sunsihen Instrumental mix. 80.Mustafa, Lisa Millett - Wake Up Everybody (Classic Mix Instrumental) Staff Productions. 81.Mustafa, Lisa Millett - Wake Up Everybody (Sunlightsquare Instrumental) Staff Productions. 82.Nick Power, Mojito, Stephanie Cooke - Let Go (Soulfuledge Remix) Soulplate Records. 83.Pad Beryll, Sofia Rubina - Love 4 Everyone (Antony Fennel Remix) Soul Deluxe. 84.Paolo Faz - Someday feat V. Ducros (Echo Motel Vocal) Bacci Bros Records. 86.Richard Brooks, Tamika Boyce - Painless Ways (Deep Roger & Rightside Remix) Strobe. 87.Rick Marshall - The Rhythm (Original Mix) Yoo'nek Records. 89.Rob Roar, Felix Baumgartner - The Beat (Chris Bailey Mix) Phonetic s.
90.Roland Clark - I Know You (Original Mix) Delete Records. 91.Ross Couch - Brighter Days Body Rhythm. 92.Savvas - Ocean Pulse (Gion Remix) Dutchie Music. 93.Soneec, Emory - My Song (Max & Sims Remix) LIP. 94.Soneec, Emory - My Song (Tripping Mix) LIP. 95.Soul Addict, Barbara Tucker - Love The Hurt Away (DJ Spen Remix) Quantize s.
96.Soul Addict, Barbara Tucker - Love the Hurt Away (Soul Addict Alternative Mix) . 97.Soulbridge, Grean Tea - After Today (Original Mix) HSR Records. 98.Soulbridge, Jenny Cruz - Believe (Jon Fernandez Mix) HSR Records. 99.Soulbridge, Rescue Poetix - Work In Progress (Alex Millet Remix) HSR Records. Tapi maaf ane tidak bisa upload data 100 lagu list lagu dj Soulful House di atas, karena memberi link download lagu di blog ini terlarang. Alasannya pasti kalian tahu sendiri. List lagu di atas bisa kalian jadikan acuan untuk download lagu di beatport dan online store khusus lagu dj di Internet (Lainnya : list soulful 2014 ). Bagi yang mau dapat data lagunya bisa ke tempat Ane, syaratnya bawa duit...hehe..